Happy Halloween Eve friends, first I would like to announce that I will be featuring “The Twelve Days of Angels” starting tomorrow. I will be featuring a different angel each day for twelve days as a prelude to their release on November 11, 2012. Their release will coincide with Smellie Bloomers’ Christmas Open House on that Sunday from 2:00-6:00pm. 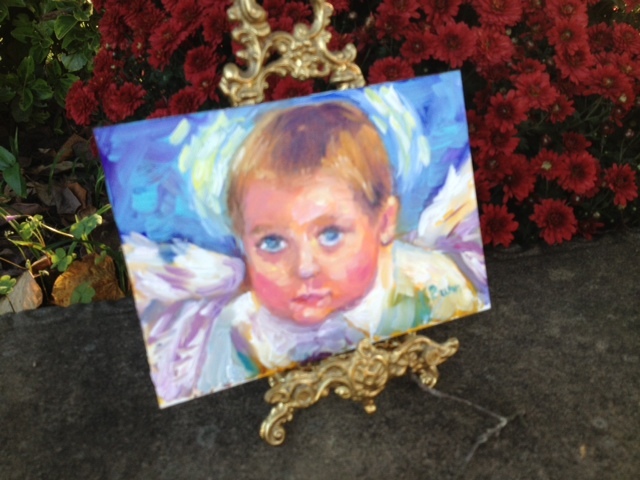 You are invited to come see me at the Christmas Open House and register for a free angel print. Save the date!! One more wonderful thing, I am proud to announce that my son Stevie will have original paintings, prints and cards for sale. Look out also for his new Facebook page called “Painted Wheels”. 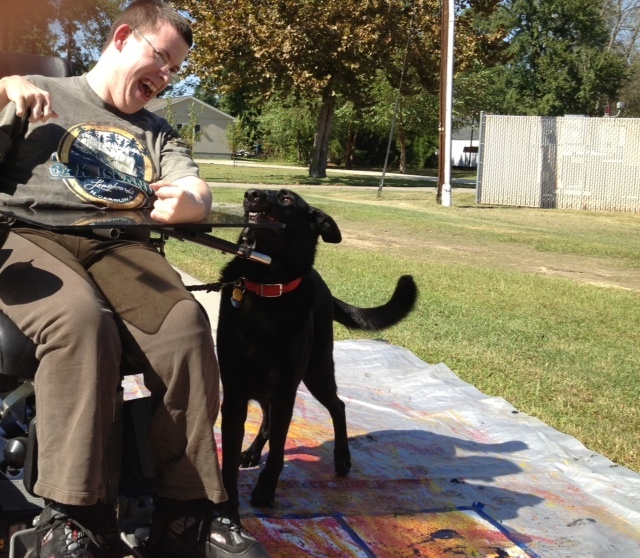 Stevie creates these paintings with his wheelchair as he pours and drips paint on canvas, then rolls over the paint and canvas with his wheelchair, sometimes Leroy (his service dog) helps by adding paw prints. Stevie’s cards and prints can be affordably framed for keepsakes. Stay tuned……………..
New collage techniques and new paints inspired me to paint “Dream Angel”. She is the first piece created on my new online class with artist Jodi Ohl. Painting is my passion, but with Jodi I’ve been trying out some brand new drawing pencils too! “Dream Angel” 8″x 8″ mixed media on gallery wrapped canvas and I am excited, I hope you like her! Pondering and dreaming about the upcoming Thanksgiving and Christmas holiday season, they are my most enjoyable times of the year. I love the thankful hearts, the joyful giving and celebrations that come with this special time. Those of you who know me, know that painting is truly my passion, but it would not be so without the support from my friends and family.Kind deeds and thoughts do not have to be grand to settle comfortably in one’s heart, often the most simple gestures can be the most uplifting. I am thankful for good friends who text me and say they have grapes fresh off the vine and ask me do I want to paint them? One friend did just that and as the result I painted “Mr. Rudolph’s Gift” . 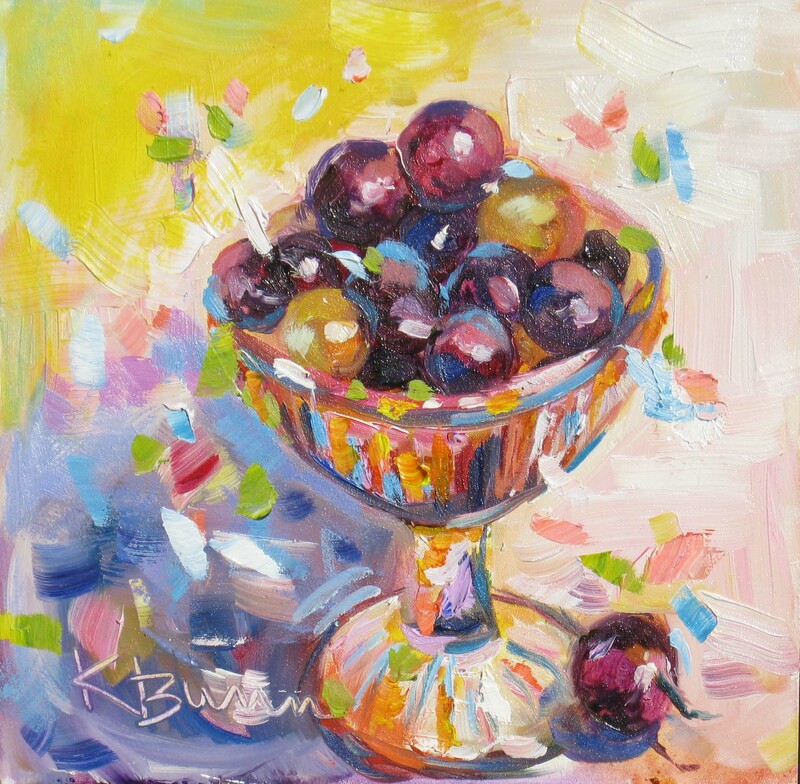 This painting will be included in “French Kisses” gallery select exhibit which celebrates everyday joys. “French Kisses” artists’ reception is tomorrow night, October 26, 2012 at Chambers Arts Gallery in Cary, NC. Last week when my husband and I were celebrating our fortieth wedding anniversary (he went fishing and I painted the town during the day, maybe that’s the secret of our 40?) 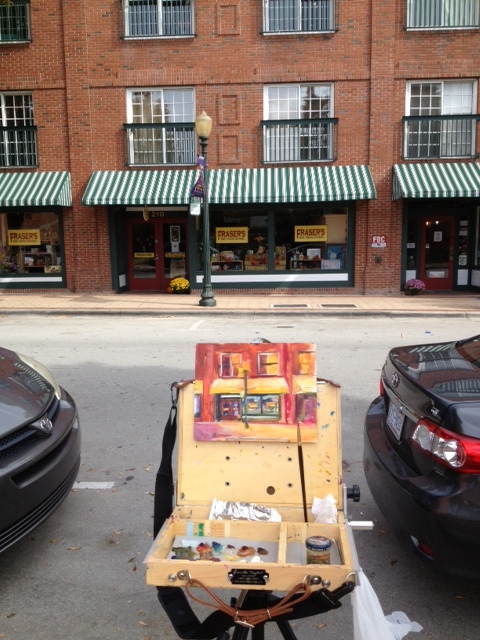 I started painting a quaint little wine shop in New Bern. As the painting progressed the owner came out and asked me if the painting was for sale, and to which I replied “yes”. The next day I delivered the painting, we worked out a bartering agreement where she got the painting and I got some really good wine. Maybe I need to hang a sign that says “will work for wine” on my easel? 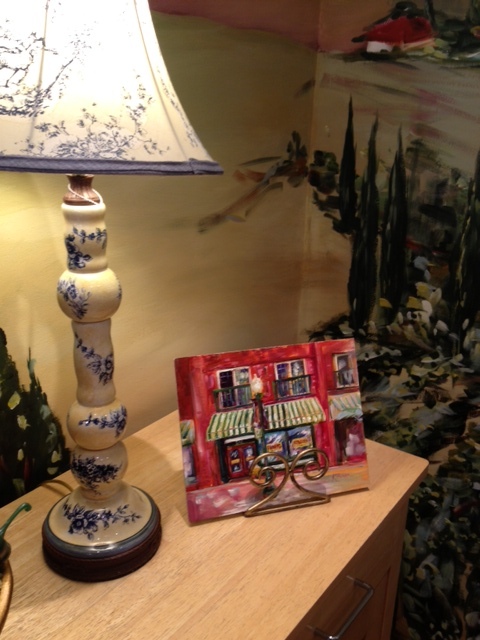 Maybe not, but I was happy to leave my little painting in her beautiful shop. “French Kisses”, my second gallery select show…. 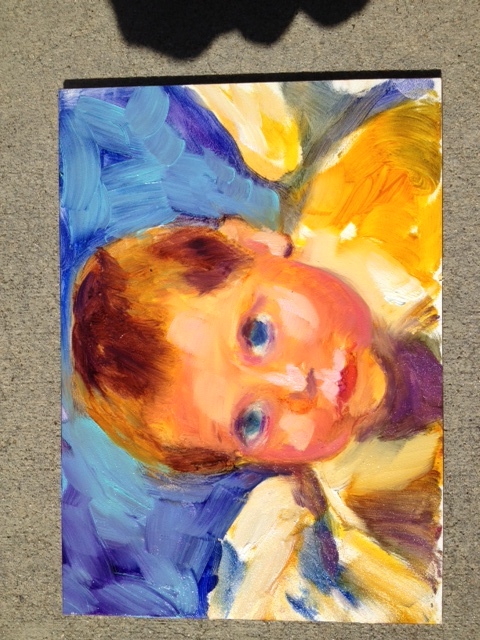 I have a couple more angels to paint, but wanted to show you my latest…still wet on the easel. 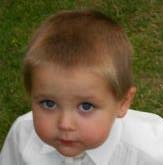 My sister-in-law, Ann, sent me a photo of a beautiful little boy, and “Nolan” became my newest angel inspiration. My Christmas 2012 Angels series will be available at Smellie Bloomers, a unique gift shop in Elizabethtown, NC on Sunday, November 11. 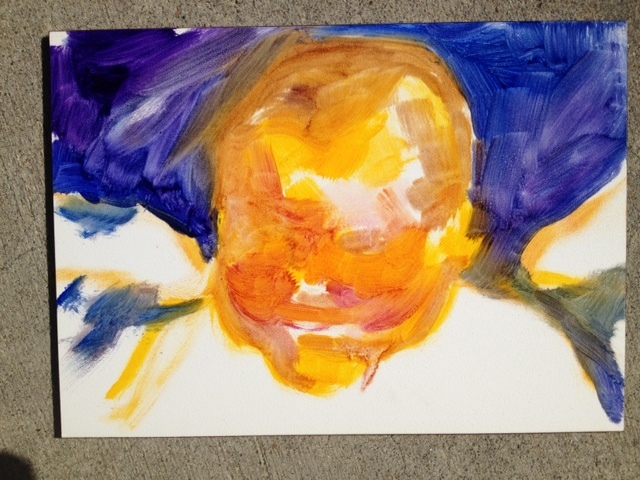 Here is “Nolan” in the first stages of painting. Sharing a brief angel painting art lesson with my friends and followers. It will show you how I start my painting and the progression of the painting from start to finished piece (I will try not to bore you). 1. First step is to find a photo that inspires you, I found a cute little boy named Bryce on Facebook (a friend). Can you guess which of Bryce’s features caught my eye? 2. Next, I blocked in the light areas with a transparent yellow and proceeded to block in the shadows transparent with magenta/purple/blue. 4. Last, I turn the painting right side up and finish details, smooth and blend, add stronger darks and brighter lights. At this stage I step back several feet from the easel and take a look at the whole painting to see how all the parts look together, and make adjustments. Turning 40! Congrats to US! 40 YEARS! My husband and I are celebrating our 40th Wedding Anniversary…October 15, 1972…Happy Anniversary to us! Want to see more angels? You are cordially invited to Smellie Bloomers Christmas Open House on Sunday, November 11, 2012. Smellie Bloomers is a unique gift shop in Elizabethtown, NC, and carries my artwork. All of my sweet angels will be revealed and will be for sale. I will also have some Christmas cards for sale. 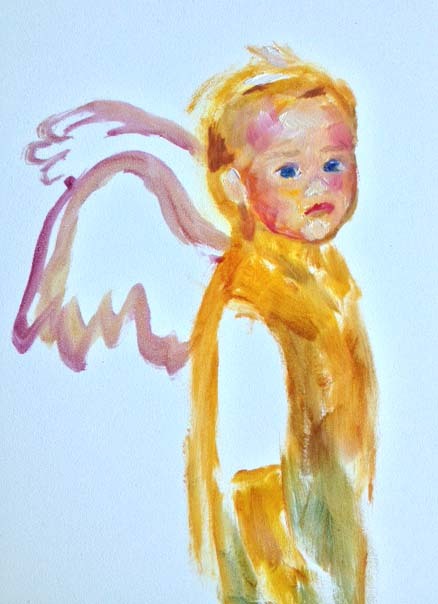 Joy, Carol, and Karen…….you can pick up your angel print that day because I used your angel quotes in my paintings. You will find me painting too, I’ll be on site with my easel, paints and canvases on hand! Save the date! I recently signed up for an online class with instructor Jodi Ohl, she’s from not too far away Aberdeen, NC. 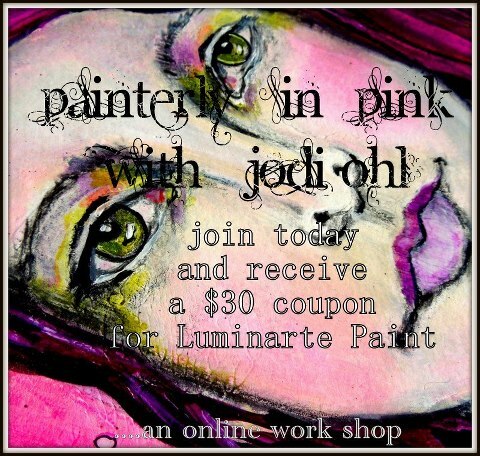 This amazing class is called “Painterly in Pink” . 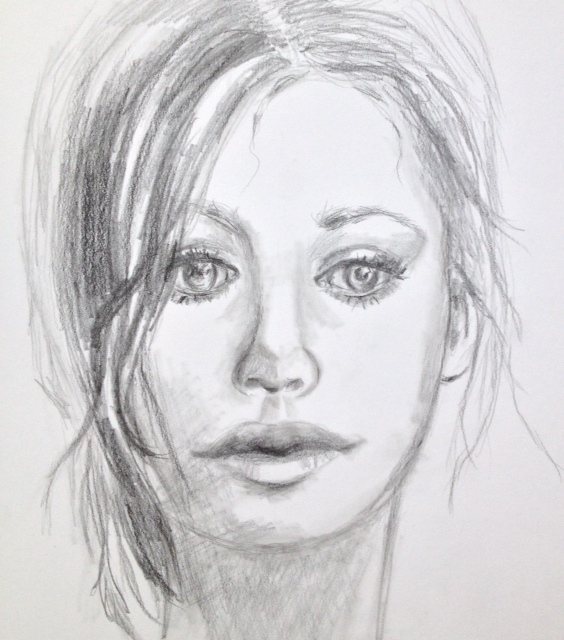 It starts off with several drawing exercises, these exercises help improve my drawing skills and I hope that my painted portraits will also benefit. Thought you might be interested in checking her out. 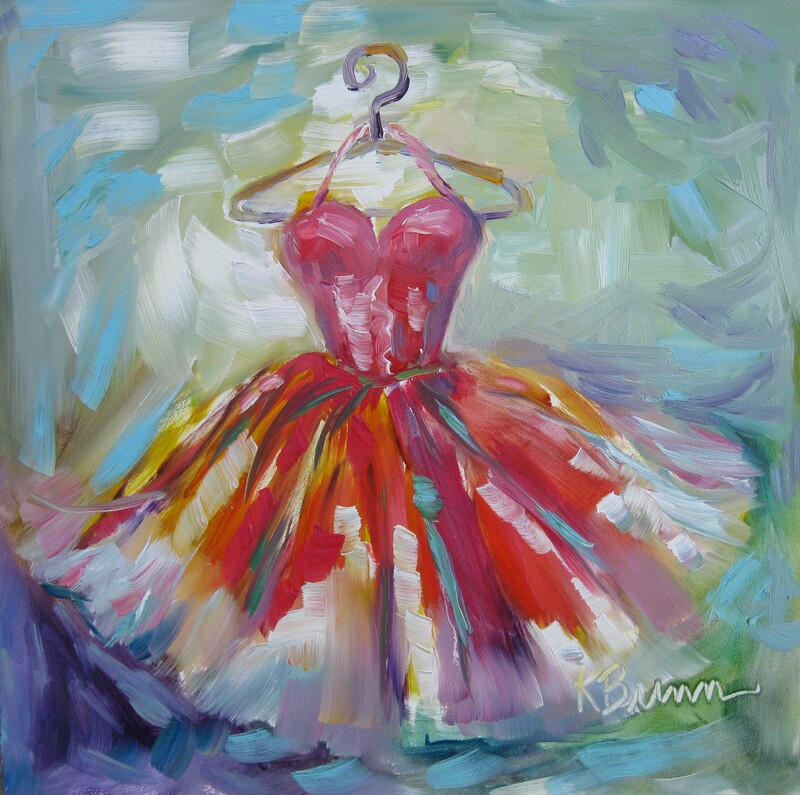 , I got the idea for this painting from a sweet young friend, Cassie (thanks girlie). 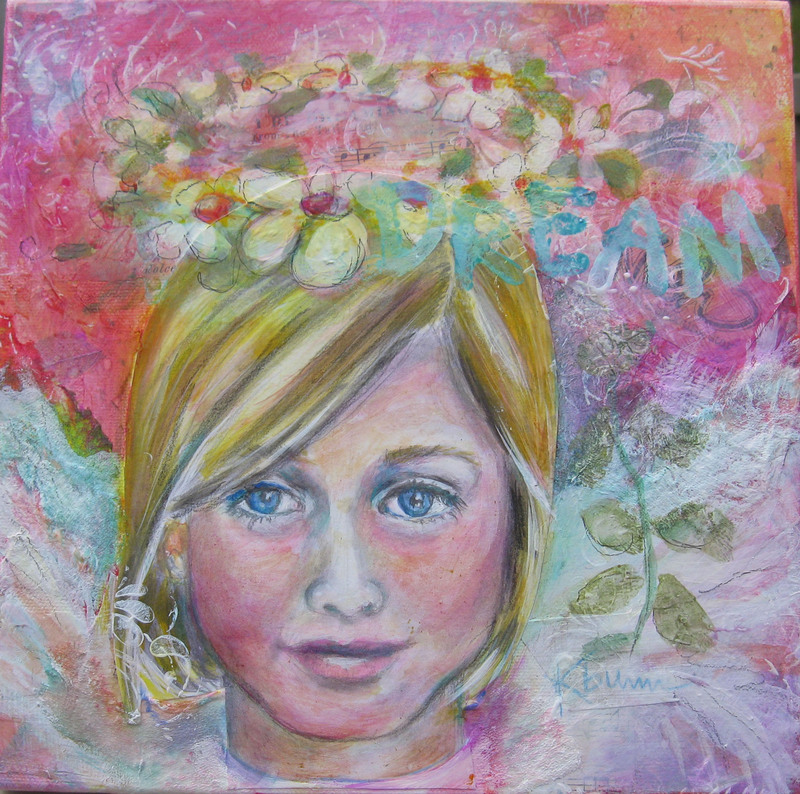 “Cassie’s Dream” is one of my paintings that will be in the upcoming Chambers Arts Gallery select exhibit in Cary, NC. Dates for the exhibit are October 22-November 14. I’m so excited! 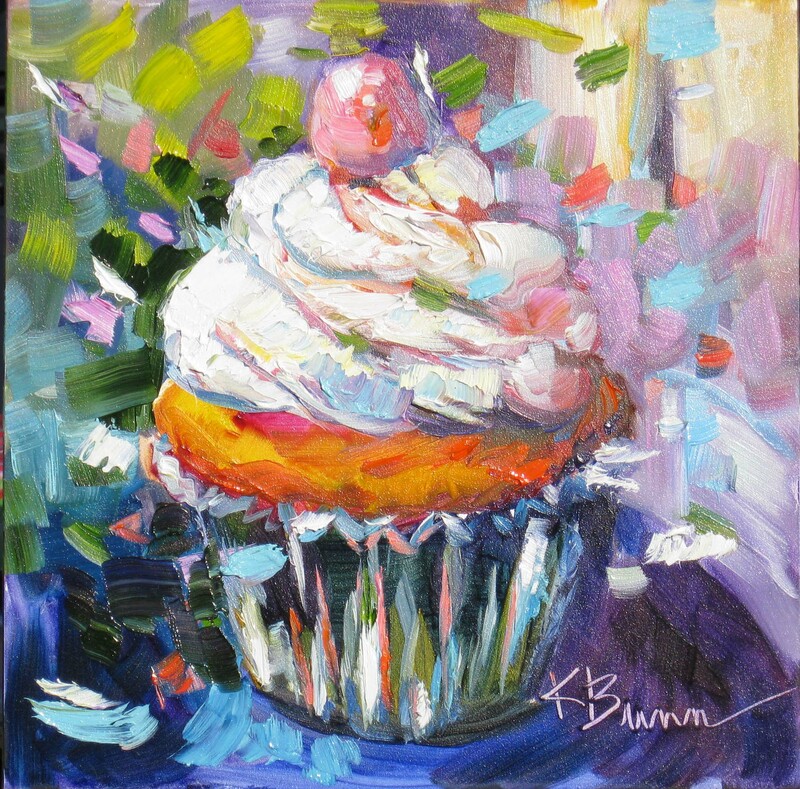 Enter your email to follow my blog and be the first to see my newest paintings.